I saw this on social media recently and it reminded me that I’ve needed to write this post for some time. Hopefully you see where the confusion is. 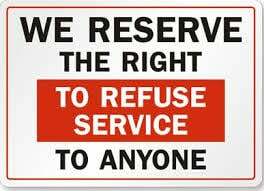 Some religious people in the South want the right to refuse service to LGBT people. And if you’ve spent any time there, you’ll know that this extends to lots of other undesirables in the more rural areas, including blacks and many other races. The problem is that the science is pretty clear on gay people. Their minds and bodies are different in measurable and scientific ways, and many gay people know they’re gay from an extremely young age. In short, it’s something someone is. Like being white, or black, or short, or tall. If someone had a rule against serving short people it’d be obviously rude and ridiculous because you can’t choose not to be short. And that’s precisely the point: you can’t choose to not be gay either. Sure, you can pretend not to be, but as many Republicans have found out, that’s often a hard thing to pull off. So that’s what a bigot is. It’s someone who hates people for what they are. Then you have someone who doesn’t like bigots and refuses to interact with them. Like the people pulling out of North Carolina because they are pursuing that legislation. 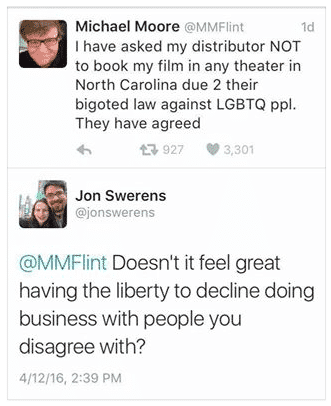 That’s no different than not serving gays or blacks in your own business if you don’t want to! The difference is that they can’t stop being white, or asian, or gay. It’s who they are. But you CAN stop hating them for it. TLDR: Hating people for what they are is not the same as being labeled a bigot for doing so. Don’t confuse the two.